CLEVELAND (AP) — Kevin Love scored a season-high 32 points, LeBron James added 30 and the Cleveland Cavaliers withstood a 40-point performance by Giannis Antetokounmpo to beat the Milwaukee Bucks 124-119 on Tuesday night. The Cavs have been one of the NBA’s biggest surprises this season — for all the wrong reasons. But after losing five of six, they did enough to hand the Bucks their fourth straight loss and keep Cleveland fans from panicking. Love, who was briefly hospitalized after scoring just four points in a surprising loss to Atlanta on Sunday, also had 16 rebounds. J.R. Smith found his shooting stroke and added a season-high 20 points for the Cavs. Still a few weeks shy of his 23rd birthday, the multi-talented Antetokounmpo finished 16 of 21 from the floor. He also had nine rebounds and eight turnovers before fouling out with 18 seconds left. Malcolm Brogdon added 22 points and Khris Middleton finished with 20 for Milwaukee. Before the game, the Bucks got some scoring help by acquiring guard Eric Bledsoe from the Phoenix Suns in exchange for forward/center Greg Monroe and two draft picks. Cleveland’s start to the season has been puzzling on so many levels. Loaded with as much talent as any team in the league, the Eastern Conference champions have been beating good teams and losing to squads they should be handling. It’s unclear what James meant, but Love and Smith helped him feel better about the state of the Cavs. Bucks coach Jason Kidd said Cleveland’s rough start may be overblown. James made a 3-pointer with 5:11 left in the fourth to put the Cavs ahead by 11, but the Bucks wouldn’t fold and closed to 116-110 on Brogdon’s 3 with 3:25 remaining. James, though, scored twice and dropped a pair of free throws as Cleveland held off a Milwaukee team that figures to contend with them this season and for seasons to come. Plagued by slow starts through their first 10 games, the Cavs came out with better intensity and focus. Cleveland shot 69 percent from the floor (11 of 16) and made 14 of 15 free throws in the first quarter while opening an 11-point lead. It was a much better showing from the Cavs’ starters, who were criticized by Dwyane Wade after Sunday’s loss. Cavaliers: James played in his 1,072nd game, tying him for 82nd place on the career list with a certain Michael Jeffrey Jordan. ... Smith passed Rashard Lewis (1,787) for 14th place on the NBA’s career 3-pointers made list. ... Cleveland is 10-2 in its last 12 games against Milwaukee. ... G Iman Shumpert returned after missing a week with a sore right knee and scored six points in 19 minutes. 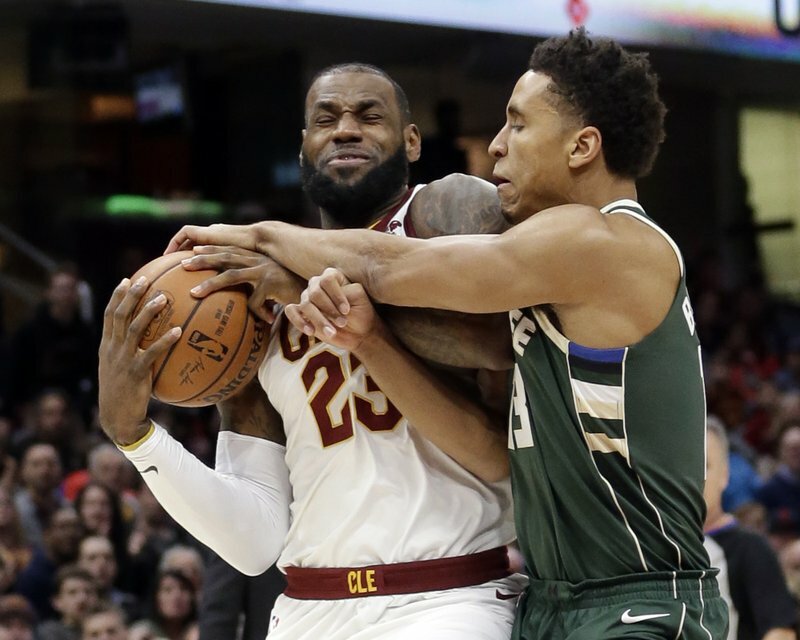 0 Response to "Love, LeBron push Cavaliers past Bucks 124-119"